If crowds don’t bother you and you want a distinctive beach experience, Coney Island is the beach of choice. The beach is three miles long with courts for basketball, handball and beach volleyball, as well as multiple playgrounds. There’s also plenty of non-beach fun for those who get antsy sitting on the sand. Thrill-seekers will enjoy the Cyclone rollercoaster and amusements at newly opened Luna Park . A fishing pier is open seasonally. The boardwalk has endless food options but beach-goers swear by Nathan’s Famous hot dogs for a delicious, cheap lunch. Year-round attractions include the Coney Island Museum, Coney Island Circus Sideshow and the New York Aquarium. Live outdoor performances take place throughout the summer, and you can stay current with the upcoming Coney Island events at http://www.coneyisland.com/. Free on-street parking is available. 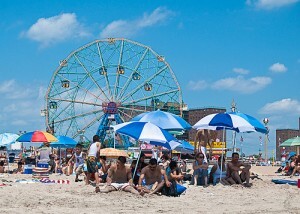 For more beach info, visit http://www.nycgovparks.org/parks/coneyisland. BUS: B36, B64, B68, B74, B82, X28, X29, X38. SUBWAY: D, F, N, Q to Coney Island-Stillwell Avenue; F, Q to West 8th Street-NY Aquarium; Q to Ocean Parkway. For a relaxing afternoon of sun, surf and beach volleyball, go to Manhattan Beach on the southern tip of Brooklyn. It’s a smaller version of Brighton Beach and less crowded than Coney Island with fewer tourists. Nearby Manhattan Beach Park also has two baseball diamonds for a pick-up game, as well as handball, basketball, tennis and volleyball areas. Concession stands offer reasonable meal choices, and parking is available at Exit 8 off of Belt Parkway for a small fee ($6 Monday-Friday and $10 weekends and holidays). For more information, visit http://www.nycgovparks.org/parks/manhattanbeachpark. SUBWAY: Take Q Train to Sheepshead Bay Road. B49 to Cheapside to Oriental and Hastings Street. Rockaway Beach is an ideal outdoorsy retreat for both families and individuals. Its 10-mile long boardwalk is perfect for an afternoon stroll, and kids will enjoy the area’s seven playgrounds. Teens and adults can skate or play volleyball. The beach is the only one near NYC to allow surfing: go to the designated zones between 67-69 streets and between 87-92 Streets (visit http://www.nycgovparks.org/facilities/beaches for more information about surf beaches). Surfboards can be rented on the beach. Grab lunch at Ciro’s Pizza, which is a favorite among beach-goers. 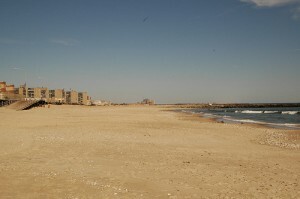 The beach offers free street parking, as well as free parking lots at B. 11th-B. 15th St. and B. 95th St. For further information, visit http://www.nycgovparks.org/parks/rockawaybeach. BUS: Q22 from bus terminal on Archer Avenue. SUBWAY: A to Broad Channel then shuttle train. Located at the end of a long, winding path, in an area with lush vegetation, Orchard Beach is harder to get to, meaning that it is usually less crowded than other New York choices although it is very popular among local residents. There are 26 athletic courts for basketball, handball and volleyball, as well as two playgrounds. The central pavilion is the place to go for lunch and shopping, as it houses several food stores and specialty shops. Parking is available for $6 Monday-Friday and $8 on weekends and holidays. Visit http://www.nycgovparks.org/sub_your_park/vt_pelham_bay_park/vt_pelham_08.html for more information. BUS: Bx12, Bx29, Bx5, Bx52, and Westchester Line number 45 serve the park. 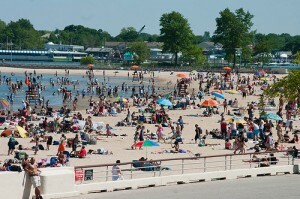 During the summer, take Bx5 and Bx12 to Orchard Beach. During the winter, take the Bx29 to the City Island Circle and walk to the beach. SUBWAY: Take the 6 line to Pelham Bay Park. Connect to bus (see above). Wolfe’s Pond Beach is an oasis far enough away from the hustle and bustle of the city that the only trace of Manhattan is a distant view. Adjacent to Wolfe’s Pond Park, the manicured beach offers several fun attractions for the whole family. Two tennis courts, a roller hockey rink, basketball courts and a playground will keep the kids busy all day long. Wolfe’s Pond Beach also has dog-friendly amenities, including an enclosed dog-only area. Several trails run through the beach and park, and there are BBQ areas as well. There’s a free parking lot on-site. Visit http://statenislandusa.com/pages/south_shore.html#wolfes for more information. BUS: #78 to Tottenville. Get off at Cornelia and Highland Blvd, walk up Cornelia. SUBWAY: Take Staten Island Transit to Hugenot Avenue, then walk toward Highland Boulevard. This entry was posted on Monday, August 23rd, 2010 at 9:13 pm	and is filed under Stuff to Do. You can follow any responses to this entry through the RSS 2.0 feed. You can leave a response, or trackback from your own site. Good morning, It’s a rare find for a nice weblog like this. I enjoyed it. Kudos to you. Have a nice day! A really well constructed post. Thanks very a great deal for posting this. Also, I wish to point out you’ve got an superb theme to your weblog! Sustain the wonderful work! Staten island is a great place to visit local beaches. south beach, midland and wolfes pond park.